The No. 6 Ohio State Buckeyes are set to face off with No. 21 Northwestern in the 2018 Big Ten Championship Game. OSU is favored by more than two touchdowns, and will likely need to win by even more than that to have a chance to sneak into the College Football Playoff field. The Buckeyes are coming off a 62-39 win over Michigan. We know that you know that already, but are guessing you’re okay with reading about it again. Northwestern went 0-3 in non-conference play, but finished 7-1 in the Big Ten. With a win, the Buckeyes would claim their second straight Big Ten title and earn either a berth in the Rose Bowl against Washington, or in the College Football Playoff field. Tony Gerdeman, Caroline Rice, and Tom Orr preview the game from Lucas Oil Stadium. They look at what the Buckeyes need to do to win, and what it could mean for their postseason chances. 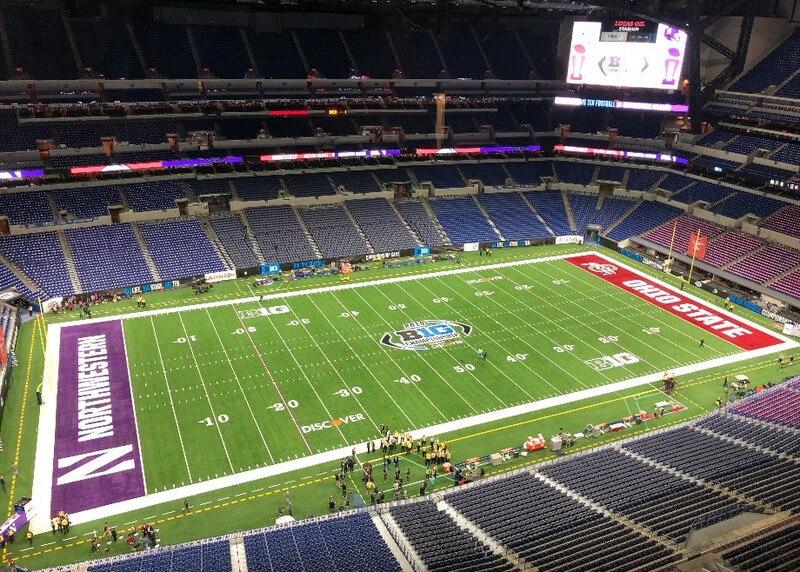 Tony Gerdeman, Caroline Rice, and Tom Orr preview the Big Ten Championship Game Live from Lucas Oil Stadium. Have questions? Ask below. What’s the over/under on how long it will be before Caroline takes Gus Johnson’s job?